"if the bodies are not hindered by any other impediments." The topic of the 5th law is what defines this "impediment" which are ubiquitous in nature and cannot be ignored. So resistance is a proportionality constant between time (change in time) and impulse/force. Resistance is basically specifying the inelasticity of a collision. This is obviously similar to the "coefficient of restitution" and may be between 0 and 1 or more likely may be between 0 and infinity. The greater the resistance the longer the collision will take place over. This is different than coefficient of restitution however because that coefficient is not used or intended to predict the time a collision will occur over. We can think of momentum like voltage and force like current. Change in voltage over resistance is current and change in momentum over resistance is force. Time is proportional to resistance. "Resistance" is proportional to the time the contact occurs for. 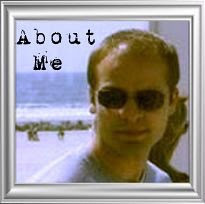 Force is going to be involved as well, the materials resistance will likely be a function of the force applied. The units of resistance are likely seconds cubed divided by kg meter but may differ depending how many other factors besides force are taken into account in it. Resistance can also be coined the "NatureSlacker coefficient" or the "Momentum transfer coefficient"
This means given a force and a highly repulsive contact you can generate a higher momentum change or impulse. An example of this is pushing a boulder. Not only does your hand need to push the boulder but so does your arm, your torso, your leg, your foot, and the earth etc etc. Another example is a bullet leaving a gun. The gas molecule pushing the bullet needs to push on the gas molecule behind it, and that one on the one behind it, etc etc, and that molecule on the gun, and the gun on the hand, etc etc. The most intuitive example of the 5th law is a "dead blow hammer". This invention utilizes the 5th law of motion to transfer more momentum than otherwise would be possible, and it works by increasing the amount of time that the forces can act. The conclusion of this law is that since force can be applied for non zero time we know that repulsive forces exist throughout the universe and therefore the universe is a closed system. Occams razor gives us the conclusion that the universe or systems of universes are infinite in all directions and are "full". There is no void into infinity. Or we are in a full "box". Tesla may describe repulsion with the term "Aether". Aristotle described the "unmoved mover" which would be a solution to this paradox. The 4th and 5th law can be collectively refered to as "advanced newtonian physics"
But he refrained to comment on exactly what is required to create a force. This requirement is the topic of this 4th law. The 4th law of motion was briefly mentioned in Newton's second law and the 4th law quantifies how MUCH force is impressed or applied from one body to another. Here is the excerpt from which "impressed" is expanded into defining how much exactly is impressed. "The alteration of motion is ever proportional to the motive force impressed; and is made in the direction of the right line in which that force is impressed." The expanded physical definition of impressed is the 4th law. Just like how Newton's Second Law did not include the equation F=ma but it was attributed to his second law because he said the alteration of motion (acceleration) is proportional (proportionality constant is mass) to the motive force (force); so it was therefore attributed to his law. In the same way various equations or systems of equations will be developed for the 4th law and will be attributed to this law but the creator(s) of the equation(s) shall have the credit of developing their equation(s). What I believe is that Galileo defined mass for the first time and Newton defined acceleration for the first time. Here we define interaction or directionality or "slip" or "grip" for the first time. Update 12:35pm PST 3/26/16 the generalized Force Transfer equation has been completed! This only works on systems of higher degrees of freedom than solids if they are fully constrained as the 4th law states. Extra equations or iterations of this equation will need to be implemented for liquids and gasses etc. that are only partially constrained. This property can be thought of as the "directionality" or the "efficiency in which a fluid or body transmits forces." F_o is the Force that the left body was undergoing prior to contact with the right body. 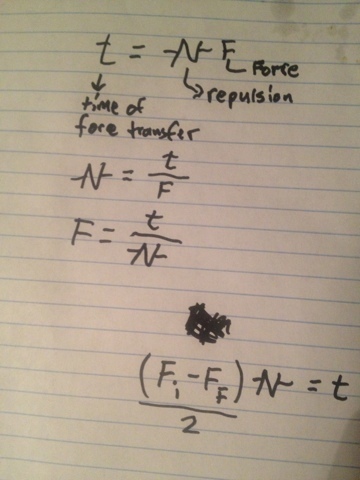 Basically what the force transfer equation means is that besides perpendicular force, you get the component of the parallel force that is proportional to the force transfer coefficient. The force transfer coefficient (also known as the NatureHacker coefficient, interaction coefficient, or simply "Interaction", or simply "directionality") must be between 0 and 1 and in most cases will probably need to be experimentally determined if it can't be derived from first principles given the physics of the systems involved in the force transfer. "Interaction" includes frictional coefficient in some systems but extends beyond that as defined in the 4th law. 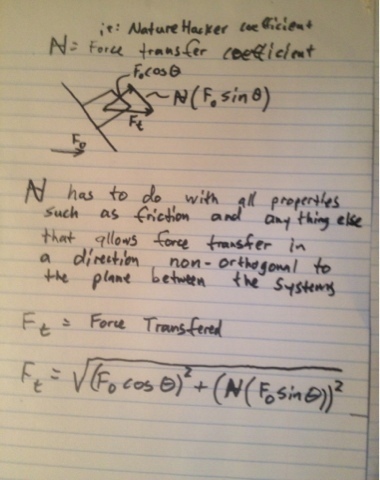 For solids sliding on planes the frictional coefficient mu will be involved as well as the normal force. But it will have to be scaled from 0 to 1. For a system or body to sustain a force as per the third law it must be limited in every direction of its degrees of freedom and remain a finite volume. The force able to be sustained by the system is directly proportional to how well its degrees of freedom are limited. For a body to sustain a force it can have no unlimited degree of freedom at any point. Solids need one dimension constrained, an orthogonal plane; this limits the solid to zero degrees of freedom as a force is applied in this way orthogonally. Liquids need 2 dimensions constrained, a cup; and gasses need 3 dimensions constrained; an enclosure. These dimensions must stay constrained to some degree the entire time a force is acting upon it. How much they stay constrained determines how much effective inertia or mass exists to be acted upon and therefore how much force can be applied. Other states of matter or special phenomenon such as plasma, light, and others may require different and/or non-material enclosures. When these are charecterized their description should be added to this law since it is still the topic of how much force can be transfered to them. The force transferred from one system to another system has one component through a right line between their contact. There exists another component through a parallel line between their contact proportional to the systems interaction to each other and is only that magnitude of the force that is actually transmitted from one system to another system via a fully defined contact in the direction of the right line between them. This contact is defined by constraints put on the systems' degrees of freedom with respect to the right line between the directions of motion. These required and fully defined contacts between the systems or bodies may be facilitated or hindered by the specific material properties of the bodies or systems in question, their interaction with the contact, and their interaction with an external medium. Some examples may include friction, surface tension, ductility, atmosperic pressure, etc. Equations should be made for every one of these material/contact/medium aspects and more and are part of this 4th law. Future laws will come about that characterize other aspects of motion that are different from the topic of this law which is the magnitude of the force that can be transfered. "Every body perseveres in its state of rest, or of uniform motion in a right line, unless it is compelled to change that state by forces impressed thereon. Projectiles persevere in their motions, so far as they are not retarded by the resistance of the air, or impelled downwards by the force of gravity. A top, whose parts by their cohesion are perpetually drawn aside from rectilinear motion, does not cease its rotation, otherwise than as it is retarded by the air. The greater bodies of the planets and comets, meeting with less resistance in more free spaces, preserve their motions both progressive and circular for a much longer time." "The alteration of motion is ever proportional to the motive force impressed; and is made in the direction of the right line in which that force is impressed. If a force generates a motion, a double force will generate double the motion, a triple force triple the motion, whether that force be impressed altogether and at once, or gradually and successively. And this motion (being always directed the same way with the generating force), if the body moved before, is added to or subducted from the former motion, according as they directly conspire with or are directly contrary to each other; or obliquely joined, when they are oblique, so as to produce a new motion compounded from the determination of both." I would like to thank my uncle for encouraging me to become myself. CRITICAL ALERT: The FDA has just handed Big Pharma a trojan horse to the supplement industry! The FDA in collaboration with big pharma has just launched an all out gestapo assault on the supplement industry. They have just made a provision that makes any plant compound that big pharma starts researching to be ILLEGAL. Thats right. Big pharma is investigating making the natural antioxidant CBD into a drug, so just the act of investigating makes it illegal to sell any products containing the fully legal CBD in any concentration. What if big pharma studied magnesium? Would all food then be illegal? What if they started investigating Reservatrol, or vitamin D or even vitamin c? Would they be illegal? This is an all out assault on humanity and we must rise up and tell them that they cannot patent nature! 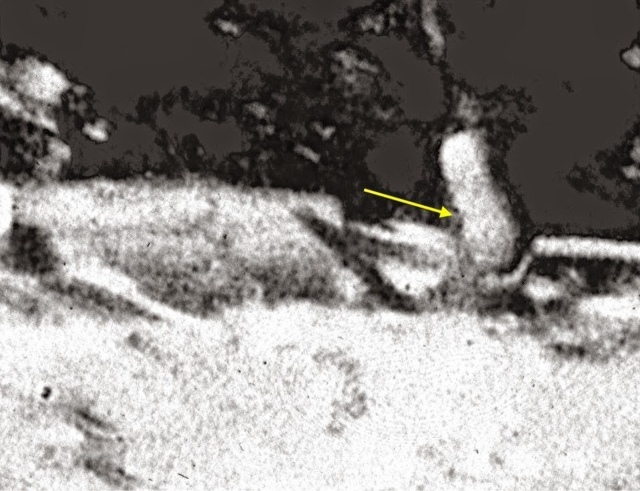 Thing is video analysis only got to this level long long after the incident (2014 this was discovered and the film made 1967, 47 years later) so no one could have anticipated the foot on the footage would be able to be seen in clarity to require putting exact foot models on the potential monkey suit. 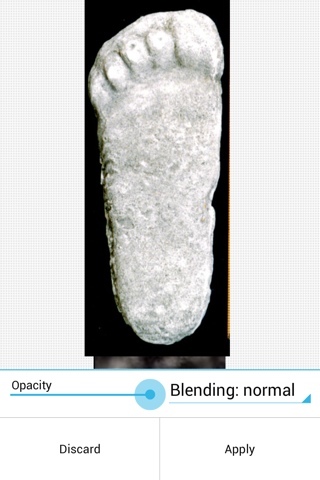 Even if someohow these feet were part of a monkey suit and the person walking in it left the footprints everyone saw, first the prints would have been very shallow if at all because it would be like wearing size 25 shoes. Secondly you wouldn't see the corect biology like with the mid tarsal break footprint. 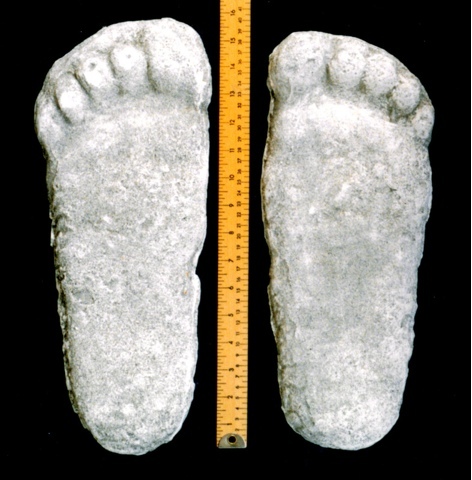 Next I pulled up a picture of the casts that Roger patterson took of the footprints that the creature left. Now I superimposed the pictures and lined them up and put the film footage over the cast of the same foot. And I start increasing the opacity. Watch what happens. Wow moving that cursor through the opacity just floored me! I was hyperventilating for minutes. I hope this amazes you just a fraction of how it amazed me! Irrefrutable proof! 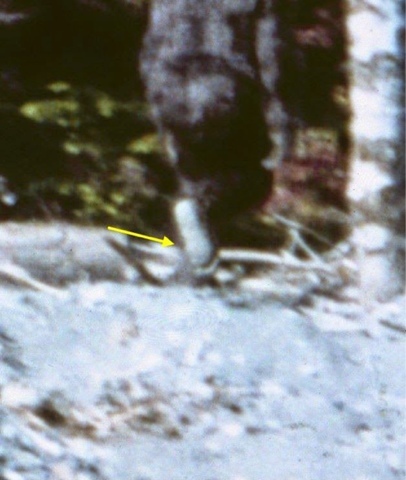 Bigfoot exists! So you have heard that goldfish jumping out of fishbowls or tank is a classic example of animal suicide. Many (probably evolutionists) liken it to human depression where someone decides they no longer want to live life. Not getting into why humans do it (bacteria mind controlling them) animals don't really do this, they do self harm but only when they are very infected (like humans). It may seem like a goldfish is committing suicide when it jumps out of a bowl but this is far from the truth. If you think a crystal clear fish tank with nothing living inside it except a fish is normal and optimal, then you are so hopelessly brainwashed that I can't help you. The truth is an average aquarium is a horribly bad habitat for a fish. Fish, like any other creature, find security in an environment that has an abundance of resources. Goldfish are comfortable in an environment where they can't be seen, lots of plants and algae growing, rotting stuff on the bottom, and mosquitoes buzzing around laying eggs which hatch into larvae. 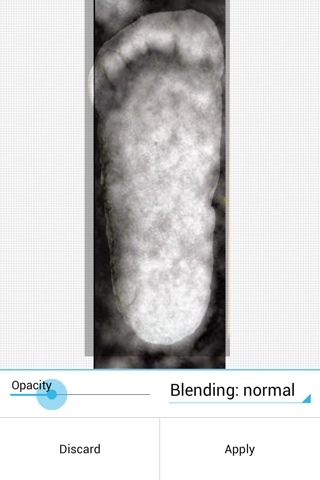 Also they need aerated water (less than other fish but still some type of dripping into the water is good). Let me guess your pristine american dream (time to wake up) aquarium doesn't provide ANY of these resources to your fish? Its like if you were put in a glass box with nothing in it not even a bed and then aliens were walking around outside and staring at you and there is nowhere to hide. I think you would try to escape too. If you could just get out; anywhere is better than there. 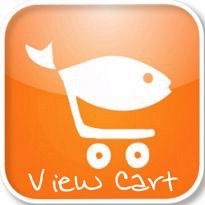 And this is also what your fish thinks. In the wild similar circumstances would occur. Fish often get trapped in shallow pools as the water level of lakes or rivers fall. Once the fish runs out of resources in their small pool they don't want to die. So they take a leap of faith (literally) and leave that pool and try to get back to the main body of water. This is what is happening in your tank. The fish has no resources in its current environment (sure you feed it once in a while but with no resources in the environment this just seems like a lucky fluke to the fish) so it takes a calculated risk to find a better habitat. Moral of the story? Wake up from the american dream and come back to the real world where the earth is a giant living ecosystem. You have devised your isolation from nature long enough. 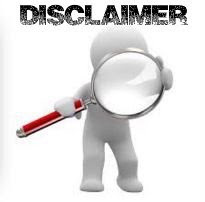 Please read the disclaimer on the right side, I do not endorse or intend any products I sell for human use however people can use anything any way they desire. I am going to recommend not to use this product internally. I am going to be experimenting using it as an all natural alternative anti-perspirant since it will likely act on sweat glands topically, but unless you really know what you are doing and use plenty of antioxidants while taking this, I don't think anyone should use it internally or any specific way. If you do use on the order of 1 drop a week since I had to highly oxidize the minerals to get them to dissolve. Keep out of reach of children, scroll down for full detail. Also see the site disclaimer on the right side bar. Many trace mineral supplements on the market are a gimmick. They claim their product contains "80 trace minerals" or something like that. I have no doubt it contains that many (most of which are toxic and not used by the body) but the key question to ask is "does it contain the daily value of the essential trace minerals?" The answer is undoubtedly no. Those supplements are nothing more than a teaspoon of rock or sea salt or fulvic acid/shilajit added to a bottle of water and dissolved. Literally that is all it is. And there is nowhere near the daily value of the important minerals per serving. Well I am here to set the precedent. After 6 months hard work it is finally finished. This is a TRUE trace mineral supplement, I bought all the minerals which are literally metals in 99.99% pure form. Then I dissolved them into their ionic form for 100% bioavailability. For the easier metals this was done with food grade nitric acid and for the tougher ones, food grade aqua regia. They were then combined and diluted. Just 3 drops contain A FULL daily value of all the trace minerals (However this is way too much to take as the minerals are in a much higher oxidation state and therefore much more bioavsilable and powerful than typical minerals) ! There is nothing on the market like this. See top of page, I don't reccomend you take this internally! For zinc, etc please see Nectar of Gaia. If you notice lower back pain or a metallic taste in the mouth temporarily discontinue use and take roughly 1-2 tsp potassium bicarbonate per day. 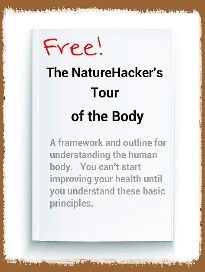 Some of these minerals are not quite known to be essential, but from my in depth research I included them because they seem to be useful to the body. For example yttrium is not "essential" but it does help prevent glutamate toxicity in the brain and is contained in human breast milk. Tellurium is selenium's big brother and part of what gives garlic its pungent smell (it is odorless in this product though). Vanadium is also not essential but it is shown in some papers to help in diabetes. Germanium, while not essential, in one research paper increased lactation in breastfeeding animals as well as improved the immune and antioxidant systems in the body. So this is a real trace mineral supplement designed to give plenty of each mineral every day in just a single drop.